This collection has been created to shed light and answer questions surrounding different types of schooling and education. We are not trying to compare, but rather give you insight into the differences. Each family will need to make their own decision regarding what works best for their child and family. There are no “right” answers. It is an individual decision that needs to be made based on your student’s individual needs, learning style, abilities, and resources. Our goal of this Education Options collection is to allow you to dive a little deeper into the possibilities and opportunities around you! Recently I did a Q & A with The New School of Lancaster, a local private Montessori school in Lancaster, PA. Even if this particular school is not local to you, Montessori schools can be found all over the world. 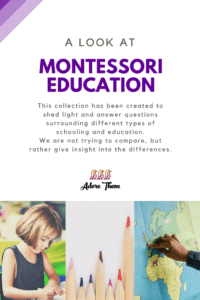 So I hope that you find this information informative, and I encourage you to check out a Montessori school near you! Even though my children did not attend this particular school, they did however attend another Montessori school for several years. Overall we had a wonderful experience, and I would highly recommend Montessori to anyone! What I loved most was that my kids were able to learn through action. They were not just taught 2+2 = 4, they physically touched the objects and regrouped to understand the numbers. And this continued through every subject. Their unique way of teaching was extremely beneficial for my son who is the type that loves to figure out how things work. Q: What is your education philosophy? The New School of Lancaster is guided by the philosophy of Maria Montessori and informed by educational research, where students enter a prepared environment and explore hands on, project based activities to acquire relevant 21st century skills. Q: What are some similarities & differences in comparison to traditional schooling? The environment is child centered and consists of hands on activities. Students learn in a multi age environment capitalizing on teaching and learning opportunities that provides. Each classroom becomes its own unit where students thrive as a community. Here at the New School, students enjoy drama, outdoor education, music, Spanish and Art. Q: How does this form of education benefit the students? Students motivation comes intrinsically, meaning students are fulfilling their own expectations. Q: What does a day in the life of one of your students look like? Our students are able to complete work at their own pace which allows for deeper exploration of some topics. The focus is on the process of learning, not an outcome of the learning. Q: How can families find more information about this style of learning? In addition to our website NewSchool.net, our accrediting agency, American Montessori Society, has a wealth of information on their website Amshq.org. A big thank you to The New School of Lancaster’s Head of School for taking the time to provide us with this information! We hope that you will give The New School consideration when deciding upon your child’s education. And if you are not local to Lancaster County, we hope that you will keep an open mind and check out your local Montessori school options.